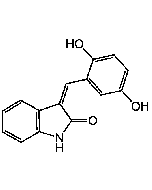 In mammals, three Aurora kinases, Aurora A, Aurora B, and Aurora C, are expressed. Aurora C expression is mainly restricted to testis, where it functions during meiosis, whereas Aurora A and B play key functions regulating mitosis. Aurora A is localized to the centrosome and spindle poles, where it drives centrosome maturation, separation, and bipolar spindle assembly. Aurora B is the central component of the chromosomal passenger complex (CPC) that also contains the inner centromere protein (INCENP), borealin, and survivin. These non-enzymatic components of the CPC play a key role in regulating kinase activity and localization. 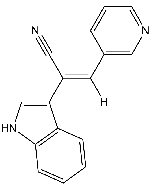 Over-expression of Aurora kinases can be oncogeneic and they have thus long been targets for cancer thearpy. 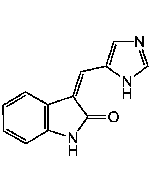 Tozasertib, or VX-680, is a potent and selective inhibitor of Aurora kinases, particularly Aurora A and B. In vitro, VX-680 blocks cell cycle progression and induces apoptosis in a wide range of human tumor types at low IC(50) values (i.e. 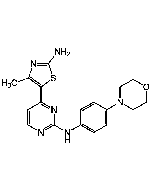 3.38nM for human BE-13 cells, and 14.34nM for NTERA cells). 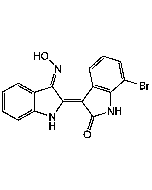 Moreover, VX680, also has very potent Ki values, with inhibition constants (Ki) of 0.6, 18, and 46nM for Aurora A, B, and C, respectively. VX-680 is also effective in vivo, being used in a Caki-1 xenograft model, VX-680 demonstrated a 75.7% (P < 0.001) decrease in Caki-1 xeno-graft tumor volume with no apparent alternation in animal body weight, peripheral blood counts, or other biological parameters.